Colors of a Creative Culture: Set in the city of Salvador in the Bahia district of Brazil, Colors of a Creative Culture introduces us to a number of artists (trained and untrained) who cover the walls of the city in vibrantly colored murals, what they refer to as “street interference art.” Their aim is to beautify the city by eliminating graffiti and advertising and to expose the community to art while trying to involve kids in creative and useful activities that would keep them out of trouble. The real strength of this program is the DVD extras, which include slide shows of the artists, interviews, and music videos. 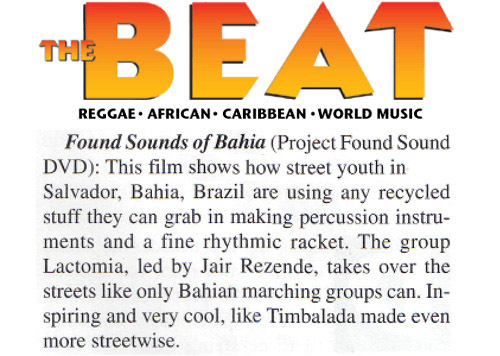 David Zucker’s short but vibrant film, “Found Sounds Bahia” documents teenage conductor-impresario Jair Rezende and “Lactomia” — a bunch of kid percussionists-turned-’fashionistas’ as they alchemize disposable cans, plastic and bottle caps into an incredible variety of musical instruments, costumes and surrealist headwear which they take from their humble urban roots in a working class neighborhood of Salvador, Bahia to the empyrean heights of center stage at Lincoln Center. Their cultural inventiveness, joy and pluck is represents a grassroots contribution of ‘glocal’ culture to human happiness. The nexus of the film is Lactomia and its members are so charming and so joyous that even a talking-head gallery of cultural anthropologists, ethnomusicologists and Worldbeat impresarios, including Carlinhos Brown (the band’s flamboyant patron) can’t bring it down. Zucker’s “Found Sound Bahia” shows ‘mea culpa’ mass-consumers that creative recycling can lead to a global warming of the soul! David Zucker has captured the true essence of what happens when children’s imaginations and creativity are allowed to flourish. This film reveals how music can be a positive force in any culture, for any age. Another important aspect of this film is the use of recycled materials to create amazing sounds. Zucker’s beautifully shot documentary shows us how this town in Brazil is making the most of their community and playing music that fulfills the soul. In The Colors of Creative Culture, a documentary by David Zucker, we are transported to an exotic world of color and sound in the heart of Brazil. This visual and auditory journey takes us into the dynamic creativity of a culture of artist and youth people living in the city of Salvador. The vitality of this piece is full of joy and inspiration — a testament to the power of imagination and heartfelt creativity of the people of Brazil. This experience tracks the intense interaction between professional artists, children, city employees and an artist who happens to be a priest. The dance between painting and Brazilian rhythms mingles in the rawness of city life — creating a powerful, artistic movement flowing out of the essence of what it is to be human. Murals, painted walls, doorways, telephone poles and bridges, become the canvases of expression with street musicians, drum beats, the Berimbau and Capoeira dancers and the vital rhythms and voices of a people full of life and explosive, self expression. David Zucker’s camera is able to capture a powerful moment of emergence in Bahia, Brazil, a moment offering a promise for all whose socio-economic poverty has smothered spirit and creativity. Through the gaze of his lens, we are treated to an up close and personal sense of how image and rhythm has rooted hope and agency where hopelessness and helplessness have too often prevailed. We meet artists offering vibrant, flowing images on the surfaces of walls and buildings that shape an otherwise bland and desolate urban landscape. Yet these images and the rhythms that accompany their creation offer a transformative experience for the film audience. Here in the colors, textures and timbres we find an enthusiasm and vitality, which in the words of the artist/community activist Carlinhos Brown shifts the aesthetic of the favela. This is a document revealing how Bahian artists enter the public sphere and liberate creative energies. From a sense of material poverty emerges the richness of renewal through human expression. We see children excited and involved, transforming their environment with color and sound. An artist tells us he came to teach, but instead, is learning from the children and the hope for the future that unleashing their creative power has revealed.